Flexible solar panels are one of the most useful devices to help you generate energy. Their flexible design makes them ideal for irregular surfaces and their high-efficiency cells allow them to generate a lot of energy. With that being said there are some problems with flexible solar panels that you should know about. Down below we discuss these issues and whether they make flexible solar panels not worth it. We recommend looking at all the information down below to make an informed decision on whether or not to buy these devices. 1. They are more expensive than rigid solar panels. While flexible solar panels use less materials than rigid solar panels, they are much more expensive. Their per watt price is much higher than traditional solar panels and can sometimes be up to 1/3 more expensive in total. This is very ironic since flexible solar panels don’t use tempered glass or aluminum. One factor that might be increasing the price is their monocrystalline wafers. Modern flexible solar panels have transfer rates up to 23%. This is very high compared to most other traditional solar panels that have a conversion rate of 18%. So their higher price is probably due to their more efficient solar panel design. 2. They can’t be tilted at an angle. 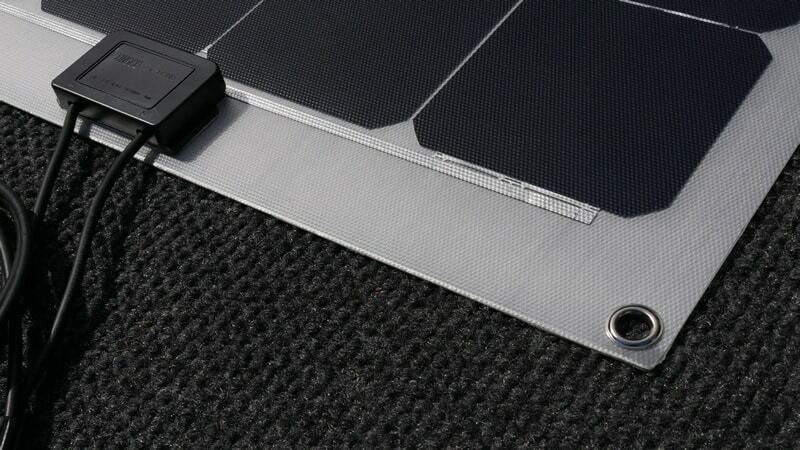 Most flexible solar panels are glued on top of a surface or installed flat through their mounting holes. This flat installation means they are fixed and cannot be tilted at an angle. While this isn’t a huge issue as most people who install solar panels do this anyway. It means you cannot get more efficient charging through tilting the panels at the best angle. The only way to get around this would be to install these panels on a backboard that is installed to a mounting rack. The only problem with this is that it defeats the purpose of the flexible nature of the solar panel and makes it more worth it to buy a traditional one. 3. They can get very hot. Since most flexible solar panels are installed directly to a roof themselves, they can get very hot. This is an issue because most RV or camper surfaces are made out of metal. This metal is highly conductive and can transfer heat to the panels themselves. In addition to this most RV solar installations have the panels installed on a mounting rack to allow air flow underneath the panels. Flexible solar panels don’t get this airflow since they are installed directly to the roof. Contrary to popular beliefs solar panels convert less energy when in hot temperatures. So this will affect the amount of energy you produce. In extreme situations the heat can burn the plastic laminate on the panel and possibly stop the panel from working in general. 4. They can be easily cut by sharp objects. Since flexible solar panels don’t use aluminum frames or tempered glass, they can easily be cut by sharp objects. Their plastic laminate is great at protecting the solar cells from the environment, but it doesn’t hold up well against things that are pointy. This is a big issue since most of these panels are installed on top of an RV roof. If you drive under low hanging branches they can easily damage the laminate and cut it. In most cases the branches will only scratch the laminate and not harm the wafers, but in extreme circumstances they can cut through the plastic and harm the solar cells. 5. Their solar cells can easily be broken on impact. As we mentioned above flexible solar panel don’t use an aluminum frame or tempered glass. These two items are extremely durable and protect the solar cells from being harmed. Since flexible solar panels don’t use these materials, they are can easily break the solar wafers on impact. In most cases you don’t have to worry about this, but there are some situations where this can occur. One situation is when this can happen is if you get stuck in a large hail storm. Large pieces of ice can easily impact the panel and break the solar wafers. Another instance this can occur is if you step on the panels while installing them. 6. Their quality can vary greatly. While there are some great manufactures of flexible solar panels, some aren’t so good and produce low quality solar panels. Since this is so their quality can vary greatly depending on multiple different factors. Some of these include the manufacturing process, performance of the panel, packaging, length of the warranty, and customer support. If you want to avoid buying a dud flexible solar panel then we recommend purchasing from ALLPOWERS or HQST. These are two of the top flexible solar manufactures as they produce high quality products. 7. They have much lower warranties. One of the best things about solar panels is that they typically have long warranties up to 25 years. These warranties give consumers a good state of mind as they ensure the panels will work for decades without having to buy new ones. Flexible solar panels, on the other hand, have much lower warranties at around 1 year to 18 months. This much lower warranty means you must buy a new panel if they stop working after the one year time frame. To make this even worse flexible solar panels typically don’t last as long as rigid solar panels since they use less durable materials. In the end flexible solar panels do have some problems and aren’t the best choice for every situation. They are much easier to break than traditional solar panels and don’t have very long warranties. With that being said they are great for those looking to install solar panels on their RV camper or boat. They also have higher conversion rates than traditional solar panels which is a huge positive.